For "capital stock" in the sense of the fixed input of a production function, see Physical capital. For the goods and materials that a business holds, see Inventory. For other uses, see Stock (disambiguation). The stock (also capital stock) of a corporation is all of the shares into which ownership of the corporation is divided. In American English, the shares are commonly known as "stocks." A single share of the stock represents fractional ownership of the corporation in proportion to the total number of shares. This typically entitles the stockholder to that fraction of the company's earnings, proceeds from liquidation of assets (after discharge of all senior claims such as secured and unsecured debt), or voting power, often dividing these up in proportion to the amount of money each stockholder has invested. Not all stock is necessarily equal, as certain classes of stock may be issued for example without voting rights, with enhanced voting rights, or with a certain priority to receive profits or liquidation proceeds before or after other classes of shareholders. Stock can be bought and sold privately or on stock exchanges, and such transactions are typically heavily regulated by governments to prevent fraud, protect investors, and benefit the larger economy. As new shares are issued by a company, the ownership and rights of existing shareholders are diluted in return for cash to sustain or grow the business. Companies can also buy back stock, which often lets investors recoup the initial investment plus capital gains from subsequent rises in stock price. Stock options, issued by many companies as part of employee compensation, do not represent ownership, but represent the right to buy ownership at a future time at a specified price. This would represent a windfall to the employees if the option is exercised when the market price is higher than the promised price, since if they immediately sold the stock they would keep the difference (minus taxes). A person who owns a percentage of the share has the ownership of the corporation proportional to his share.The shares form stock. The stock of a corporation is partitioned into shares, the total of which are stated at the time of business formation. Additional shares may subsequently be authorized by the existing shareholders and issued by the company. In some jurisdictions, each share of stock has a certain declared par value, which is a nominal accounting value used to represent the equity on the balance sheet of the corporation. In other jurisdictions, however, shares of stock may be issued without associated par value. Shares represent a fraction of ownership in a business. A business may declare different types (or classes) of shares, each having distinctive ownership rules, privileges, or share values. Ownership of shares may be documented by issuance of a stock certificate. A stock certificate is a legal document that specifies the number of shares owned by the shareholder, and other specifics of the shares, such as the par value, if any, or the class of the shares.Atashimanakhode. In the United Kingdom, Republic of Ireland, South Africa, and Australia, stock can also refer to completely different financial instruments such as government bonds or, less commonly, to all kinds of marketable securities. Stock typically takes the form of shares of either common stock or preferred stock. As a unit of ownership, common stock typically carries voting rights that can be exercised in corporate decisions. Preferred stock differs from common stock in that it typically does not carry voting rights but is legally entitled to receive a certain level of dividend payments before any dividends can be issued to other shareholders. [page needed] Convertible preferred stock is preferred stock that includes an option for the holder to convert the preferred shares into a fixed number of common shares, usually any time after a predetermined date. Shares of such stock are called "convertible preferred shares" (or "convertible preference shares" in the UK). New equity issue may have specific legal clauses attached that differentiate them from previous issues of the issuer. Some shares of common stock may be issued without the typical voting rights, for instance, or some shares may have special rights unique to them and issued only to certain parties. Often, new issues that have not been registered with a securities governing body may be restricted from resale for certain periods of time. Preferred stock may be hybrid by having the qualities of bonds of fixed returns and common stock voting rights. They also have preference in the payment of dividends over common stock and also have been given preference at the time of liquidation over common stock. They have other features of accumulation in dividend. In addition, preferred stock usually comes with a letter designation at the end of the security; for example, Berkshire-Hathaway Class "B" shares sell under stock ticker BRK.B, whereas Class "A" shares of ORION DHC, Inc will sell under ticker OODHA until the company drops the "A" creating ticker OODH for its "Common" shares only designation. This extra letter does not mean that any exclusive rights exist for the shareholders but it does let investors know that the shares are considered for such, however, these rights or privileges may change based on the decisions made by the underlying company. "Rule 144 Stock" is an American term given to shares of stock subject to SEC Rule 144: Selling Restricted and Control Securities. Under Rule 144, restricted and controlled securities are acquired in unregistered form. Investors either purchase or take ownership of these securities through private sales (or other means such as via ESOPs or in exchange for seed money) from the issuing company (as in the case with Restricted Securities) or from an affiliate of the issuer (as in the case with Control Securities). Investors wishing to sell these securities are subject to different rules than those selling traditional common or preferred stock. These individuals will only be allowed to liquidate their securities after meeting the specific conditions set forth by SEC Rule 144. Rule 144 allows public re-sale of restricted securities if a number of different conditions are met. Stock futures are contracts where the buyer is long, i.e., takes on the obligation to buy on the contract maturity date, and the seller is short, i.e., takes on the obligation to sell. Stock index futures are generally delivered by cash settlement. During the Roman Republic, the state contracted (leased) out many of its services to private companies. These government contractors were called publicani, or societas publicanorum as individual companies. These companies were similar to modern corporations, or joint-stock companies more specifically, in a couple of aspects. They issued shares called partes (for large cooperatives) and particulae which were small shares that acted like today's over-the-counter shares. Polybius mentions that "almost every citizen" participated in the government leases. There is also an evidence that the price of stocks fluctuated. The Roman orator Cicero speaks of partes illo tempore carissimae, which means “shares that had a very high price at that time." This implies a fluctuation of price and stock market behavior in Rome. Around 1250 in France at Toulouse, 96 shares of the Société des Moulins du Bazacle, or Bazacle Milling Company were traded at a value that depended on the profitability of the mills the society owned. As early as 1288, the Swedish mining and forestry products company Stora has documented a stock transfer, in which the Bishop of Västerås acquired a 12.5% interest in the mine (or more specifically, the mountain in which the copper resource was available, the Great Copper Mountain) in exchange for an estate. The earliest recognized joint-stock company in modern times was the English (later British) East India Company, one of the most famous joint-stock companies. It was granted an English Royal Charter by Elizabeth I on December 31, 1600, with the intention of favouring trade privileges in India. The Royal Charter effectively gave the newly created Honourable East India Company (HEIC) a 15-year monopoly on all trade in the East Indies. The company transformed from a commercial trading venture to one that virtually ruled India as it acquired auxiliary governmental and military functions, until its dissolution. The East India Company's flag initially had the flag of England, St. George's Cross, in the corner. Soon afterwards, in 1602, the Dutch East India Company issued the first shares that were made tradeable on the Amsterdam Stock Exchange, an invention that enhanced the ability of joint-stock companies to attract capital from investors as they now easily could dispose of their shares. The Dutch East India Company became the first multinational corporation and the first megacorporation. Between 1602 and 1796 it traded 2.5 million tons of cargo with Asia on 4,785 ships and sent a million Europeans to work in Asia, surpassing all other rivals. The innovation of joint ownership made a great deal of Europe's economic growth possible following the Middle Ages. The technique of pooling capital to finance the building of ships, for example, made the Netherlands a maritime superpower. Before adoption of the joint-stock corporation, an expensive venture such as the building of a merchant ship could be undertaken only by governments or by very wealthy individuals or families. Economic historians[who?] find the Dutch stock market of the 17th century particularly interesting: there is clear documentation of the use of stock futures, stock options, short selling, the use of credit to purchase shares, a speculative bubble that crashed in 1695, and a change in fashion that unfolded and reverted in time with the market (in this case it was headdresses instead of hemlines). Edward Stringham also noted that the uses of practices such as short selling continued to occur during this time despite the government passing laws against it. This is unusual because it shows individual parties fulfilling contracts that were not legally enforceable and where the parties involved could incur a loss. Stringham argues that this shows that contracts can be created and enforced without state sanction or, in this case, in spite of laws to the contrary. A shareholder (or stockholder) is an individual or company (including a corporation) that legally owns one or more shares of stock in a joint stock company. Both private and public traded companies have shareholders. Shareholders are one type of stakeholders, who may include anyone who has a direct or indirect equity interest in the business entity or someone with a non-equity interest in a non-profit organization. Thus it might be common to call volunteer contributors to an association stakeholders, even though they are not shareholders. However, in a few unusual cases, some courts have been willing to imply such a duty between shareholders. For example, in California, USA, majority shareholders of closely held corporations have a duty not to destroy the value of the shares held by minority shareholders. The owners of a private company may want additional capital to invest in new projects within the company. They may also simply wish to reduce their holding, freeing up capital for their own private use. They can achieve these goals by selling shares in the company to the general public, through a sale on a stock exchange. This process is called an initial public offering, or IPO. By selling shares they can sell part or all of the company to many part-owners. The purchase of one share entitles the owner of that share to literally share in the ownership of the company, a fraction of the decision-making power, and potentially a fraction of the profits, which the company may issue as dividends. The owner may also inherit debt and even litigation. In a typical case, each share constitutes one vote. Corporations may, however, issue different classes of shares, which may have different voting rights. Owning the majority of the shares allows other shareholders to be out-voted – effective control rests with the majority shareholder (or shareholders acting in concert). In this way the original owners of the company often still have control of the company. Even though the board of directors runs the company, the shareholder has some impact on the company's policy, as the shareholders elect the board of directors. Each shareholder typically has a percentage of votes equal to the percentage of shares he or she owns. So as long as the shareholders agree that the management (agent) are performing poorly they can select a new board of directors which can then hire a new management team. In practice, however, genuinely contested board elections are rare. Board candidates are usually nominated by insiders or by the board of the directors themselves, and a considerable amount of stock is held or voted by insiders. In general, the shares of a company may be transferred from shareholders to other parties by sale or other mechanisms, unless prohibited. Most jurisdictions have established laws and regulations governing such transfers, particularly if the issuer is a publicly traded entity. The desire of stockholders to trade their shares has led to the establishment of stock exchanges, organizations which provide marketplaces for trading shares and other derivatives and financial products. Today, stock traders are usually represented by a stockbroker who buys and sells shares of a wide range of companies on such exchanges. A company may list its shares on an exchange by meeting and maintaining the listing requirements of a particular stock exchange. In the United States, through the intermarket trading system, stocks listed on one exchange can often also be traded on other participating exchanges, including electronic communication networks (ECNs), such as Archipelago or Instinet. 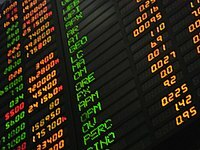 Many large non-U.S companies choose to list on a U.S. exchange as well as an exchange in their home country in order to broaden their investor base. These companies must maintain a block of shares at a bank in the US, typically a certain percentage of their capital. On this basis, the holding bank establishes American depositary shares and issues an American depositary receipt (ADR) for each share a trader acquires. Likewise, many large U.S. companies list their shares at foreign exchanges to raise capital abroad. Small companies that do not qualify and cannot meet the listing requirements of the major exchanges may be traded over-the-counter (OTC) by an off-exchange mechanism in which trading occurs directly between parties. The major OTC markets in the United States are the electronic quotation systems OTC Bulletin Board (OTCBB) and OTC Markets Group (formerly known as Pink OTC Markets Inc.) where individual retail investors are also represented by a brokerage firm and the quotation service's requirements for a company to be listed are minimal. Shares of companies in bankruptcy proceedings are usually listed by these quotation services after the stock is delisted from an exchange. There are various methods of buying and financing stocks, the most common being through a stockbroker. Brokerage firms, whether they are a full-service or discount broker, arrange the transfer of stock from a seller to a buyer. Most trades are actually done through brokers listed with a stock exchange. When it comes to financing a purchase of stocks there are two ways: purchasing stock with money that is currently in the buyer's ownership, or by buying stock on margin. Buying stock on margin means buying stock with money borrowed against the value of stocks in the same account. These stocks, or collateral, guarantee that the buyer can repay the loan; otherwise, the stockbroker has the right to sell the stock (collateral) to repay the borrowed money. He can sell if the share price drops below the margin requirement, at least 50% of the value of the stocks in the account. Buying on margin works the same way as borrowing money to buy a car or a house, using a car or house as collateral. Moreover, borrowing is not free; the broker usually charges 8–10% interest. The price of a stock fluctuates fundamentally due to the theory of supply and demand. Like all commodities in the market, the price of a stock is sensitive to demand. However, there are many factors that influence the demand for a particular stock. The fields of fundamental analysis and technical analysis attempt to understand market conditions that lead to price changes, or even predict future price levels. A recent study shows that customer satisfaction, as measured by the American Customer Satisfaction Index (ACSI), is significantly correlated to the market value of a stock. Stock price may be influenced by analysts' business forecast for the company and outlooks for the company's general market segment. Stocks can also fluctuate greatly due to pump and dump scams. At any given moment, an equity's price is strictly a result of supply and demand. The supply, commonly referred to as the float, is the number of shares offered for sale at any one moment. The demand is the number of shares investors wish to buy at exactly that same time. The price of the stock moves in order to achieve and maintain equilibrium. The product of this instantaneous price and the float at any one time is the market capitalization of the entity offering the equity at that point in time. That does not explain how people decide the maximum price at which they are willing to buy or the minimum at which they are willing to sell. In professional investment circles the efficient market hypothesis (EMH) continues to be popular, although this theory is widely discredited in academic and professional circles. Briefly, EMH says that investing is overall (weighted by the standard deviation) rational; that the price of a stock at any given moment represents a rational evaluation of the known information that might bear on the future value of the company; and that share prices of equities are priced efficiently, which is to say that they represent accurately the expected value of the stock, as best it can be known at a given moment. In other words, prices are the result of discounting expected future cash flows. Another theory of share price determination comes from the field of Behavioral Finance. According to Behavioral Finance, humans often make irrational decisions—particularly, related to the buying and selling of securities—based upon fears and misperceptions of outcomes. The irrational trading of securities can often create securities prices which vary from rational, fundamental price valuations. For instance, during the technology bubble of the late 1990s (which was followed by the dot-com bust of 2000–2002), technology companies were often bid beyond any rational fundamental value because of what is commonly known as the "greater fool theory". The "greater fool theory" holds that, because the predominant method of realizing returns in equity is from the sale to another investor, one should select securities that they believe that someone else will value at a higher level at some point in the future, without regard to the basis for that other party's willingness to pay a higher price. Thus, even a rational investor may bank on others' irrationality. When companies raise capital by offering stock on more than one exchange, the potential exists for discrepancies in the valuation of shares on different exchanges. A keen investor with access to information about such discrepancies may invest in expectation of their eventual convergence, known as arbitrage trading. Electronic trading has resulted in extensive price transparency (efficient-market hypothesis) and these discrepancies, if they exist, are short-lived and quickly equilibrated. ^ "stock Definition". Investopedia. Retrieved 25 February 2012. ^ "Cambridge Advanced Learner's Dictionary". Dictionary.cambridge.org. Retrieved 12 February 2010. ^ "Common Stock vs. Preferred Stock, and Stock Classes". InvestorGuide.com. ^ Zvi Bodie, Alex Kane, Alan J. Marcus, Investments, 9th Ed., ISBN 978-0078034695. ^ "Rule 144: Selling Restricted and Control Securities". US Securities and Exchange Commission. Retrieved 18 May 2013. ^ "Black Scholes Calculator". Tradingtoday.com. Retrieved 12 February 2010. ^ The oldest share in the world, issued by the Dutch East India Company (Vereenigde Oost-Indische Compagnie or VOC), 1606. ^ "Jones v. H.F. Ahmanson & Co. (1969) 1 C3d 93". Online.ceb.com. Retrieved 12 February 2010. ^ Jackson, Thomas (2001). The Logic and Limits of Bankruptcy Law. Oxford Oxfordshire: Oxford University Press. p. 32. ISBN 1-58798-114-9. ^ "Stock Trading". ShareWorld. Retrieved 24 February 2012. ^ "Stock Trading". US Securities and Exchange Commission. Retrieved 18 May 2013. ^ Mithas, Sunil (January 2006). "Increased Customer Satisfaction Increases Stock Price". Research@Smith. University of Maryland. Archived from the original on 17 March 2012. Retrieved 25 February 2012. ^ "Understanding Stock Prices: Bid, Ask, Spread". Youngmoney.com. Retrieved 12 February 2010. This page was last edited on 16 April 2019, at 04:16 (UTC).